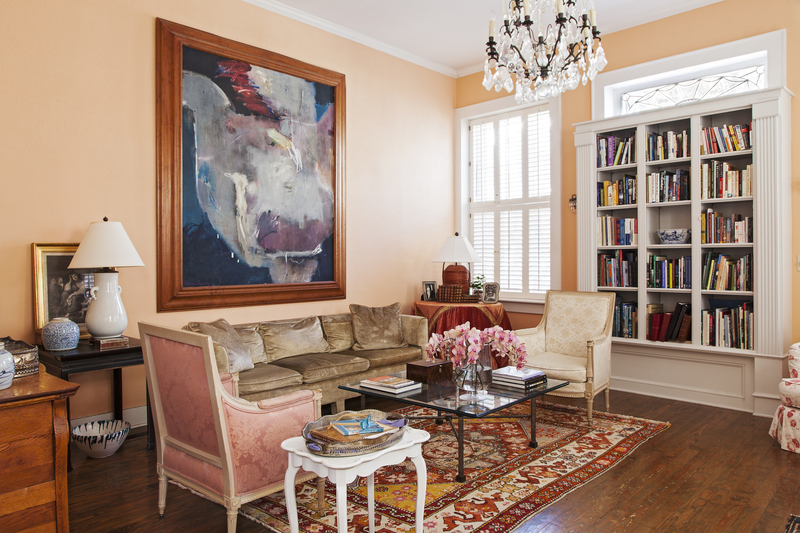 When she moved in, she added curved beds and a pierced brick partition to hide the AC unit. 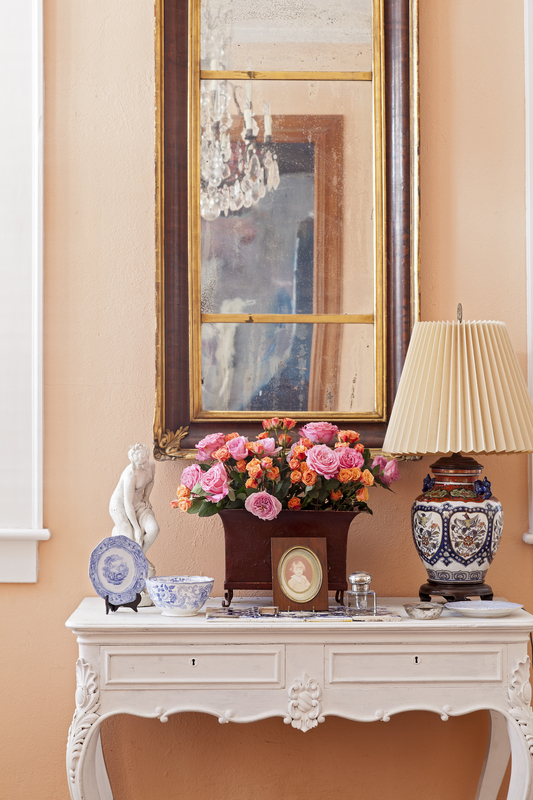 Fresh flowers are a staple of Bigner’s style. “You can take everything away from me, but I always have to have fresh flowers in the house!” she says. 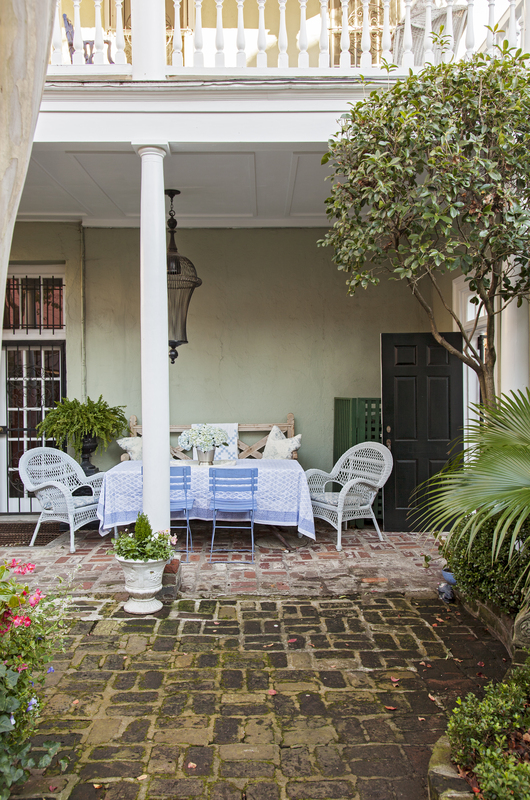 Holding Court: This charming courtyard is Bigner’s favorite place to entertain. Personal History: Once belonging to her grandmother, this mid-18th-century peasant-style Louis XVI cabinet was gifted to Bigner by her parents on her 18th birthday. It looks right at home positioned next to a painting of the North Jutland farm where her grandmother grew up. 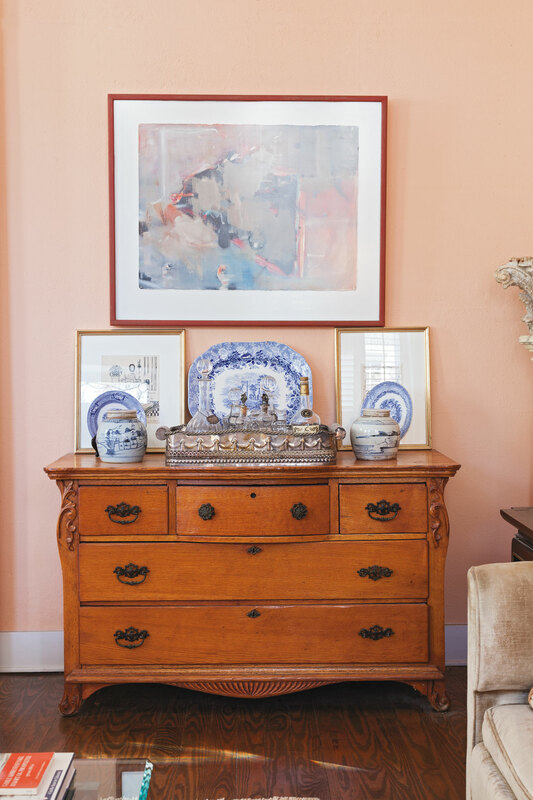 A tableau including blue-and-white pottery, silver, a painting by Eva Carter, and Bigner’s own sketches tops an antique bureau. 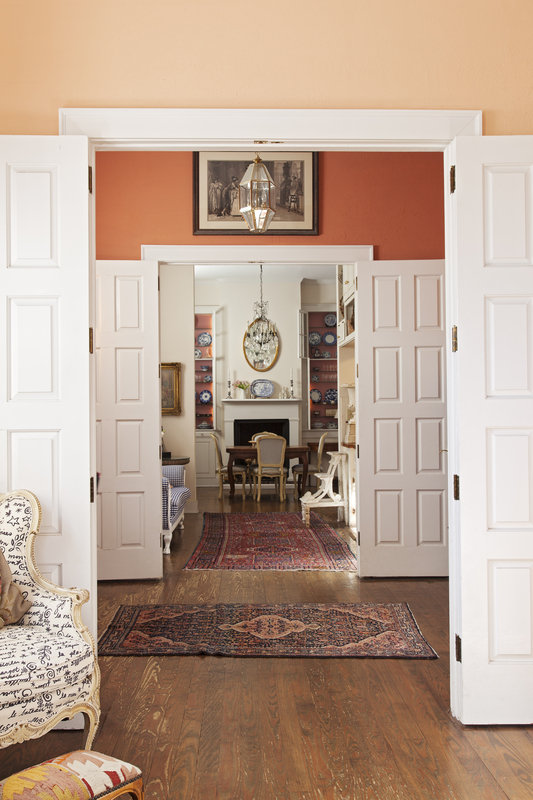 Paneled wood doors allow the space to be at turns intimate and airy. 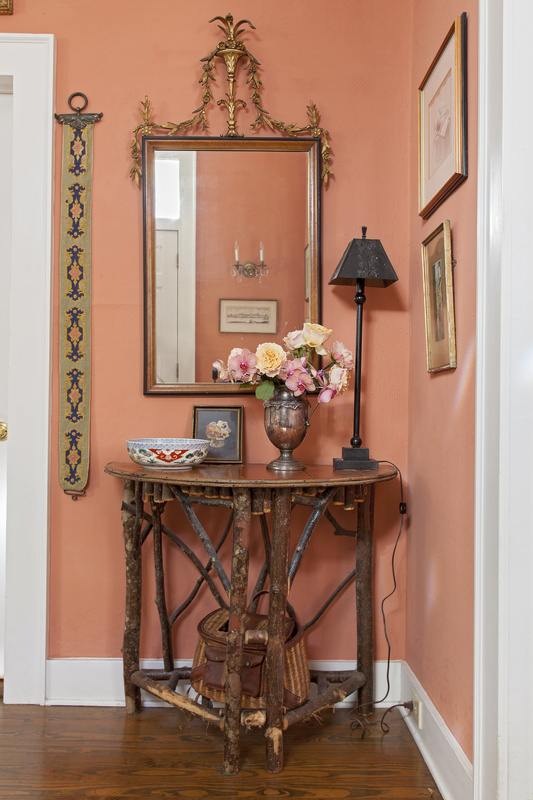 First Blush: This mirror is one of the first things Bigner purchased for the house; she liked how its height complemented the ceilings. Display of Affection: Beloved collections of china (including Flow Blue and Blue Willow pieces) are on display in the dining room. Bigner added ticking to these chairs to balance their elegant shape with a more casual, inviting vibe. Bob Hines of R Squared Mirror Glass antiqued the mirror in the upstairs den. Creative Haven: Bigner spends hours drawing in the sunlit art studio out back. 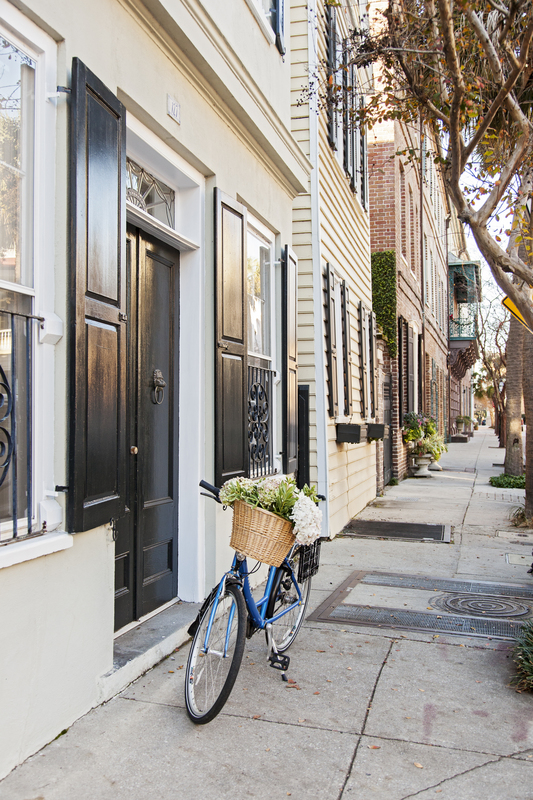 Last year, she replaced the petite building’s French doors with high-end vinyl-clad versions that are also super low-maintenance: they’re waterproof, don’t rot, and can be easily hosed off. Bigner’s considered approach extends well beyond her petite garden. 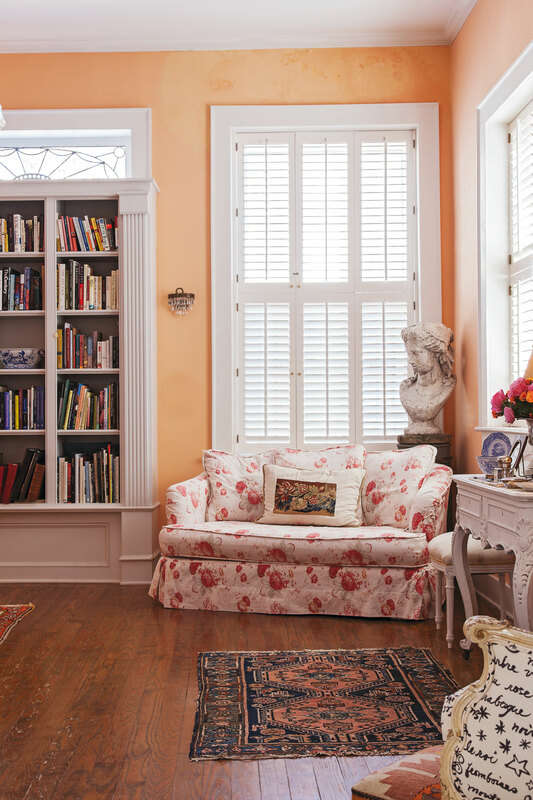 Inside, the stucco-over-brick abode is artfully furnished with family heirlooms from her childhood in Europe. (She was born and reared in Copenhagen, Denmark, and spent summers at her family’s house on the Baltic Sea.) 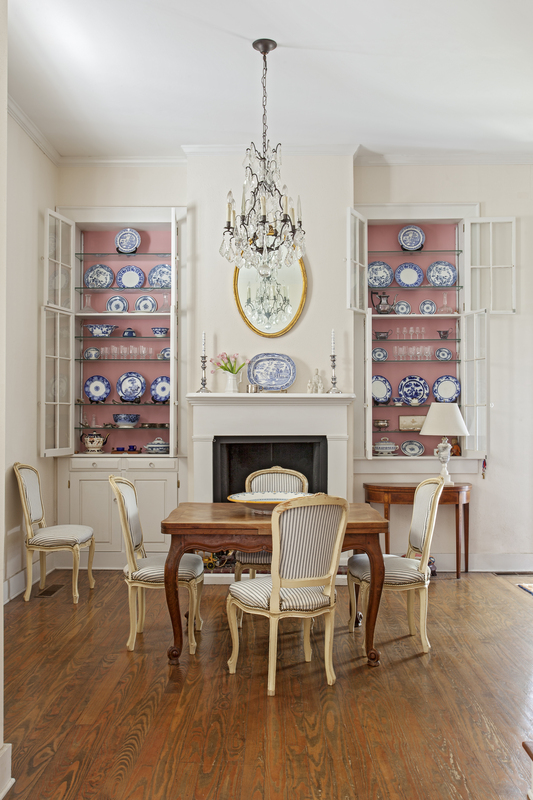 Groupings of cherished objects, such as vintage and new copper pans and antique Royal Copenhagen and Blue Willow china, have been carefully collected over time. 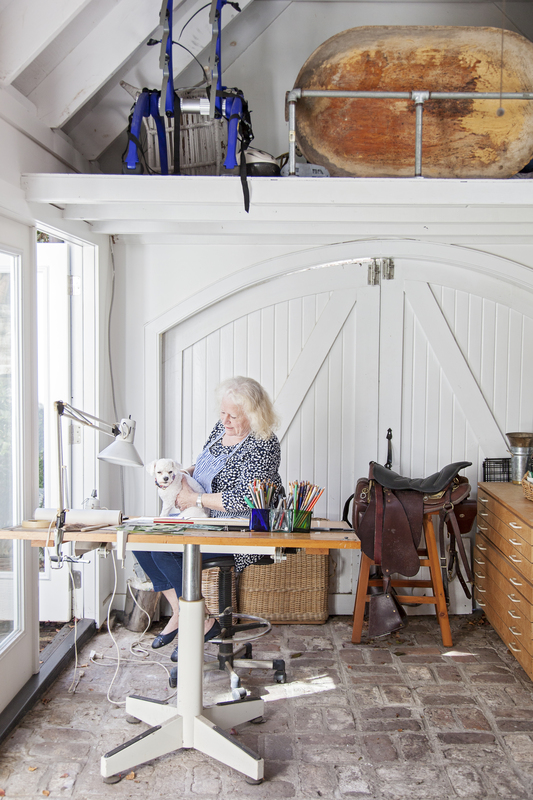 Even the ink drawings that hang in the living room are products of patience: Bigner—a lifelong artist who apprenticed as a furniture maker before making a career in landscape design and land planning—drew them herself over countless hours at her desk in the copper-roofed artist’s studio out back. In this era of instant gratification, the place exemplifies “slow decorating,” the thoughtful curation of spaces over time. It may sound like a snap decision, but for Bigner, it felt more like a homecoming. With its gabled roof, dormers, and long rows of windows overlooking a quiet cobblestoned stretch of Chalmers Street, the early-19th-century building evoked memories of her circa-1772 childhood home in Copenhagen’s Christianshavn neighborhood. “You know, you always somehow try to find the things that made you happy when you were a child—for the rest of your life you’re looking for that,” she muses. But it wasn’t just about happy associations; the Colonial-style single house with a piazza on the western end was charming in its own right. On that first visit, Bigner was struck by the soaring 12-foot ceilings and unique open layout: rooms are en suite, separated by paneled wood doors that can be thrown open to promote flow or closed off to accommodate private moments. Either way, the rooms are well-lit; all those aforementioned windows let the South Carolina sunshine pour in. “I knew this was it because of the space and the openness and the light,” she says. She also felt drawn to the neighborhood itself, where the passage of time is palpable. Echoes of the past can be heard in the clop of horses’ hooves, and centuries of wear can be seen on the richly patinaed cobblestones and buildings—all of which appeals to Bigner’s European sensibility. What’s more, she’s found the close-knit community to be brimming with kindred spirits. “The fabric of this little area has something artistic to it; it’s filled with quirky people, myself included,” she explains. 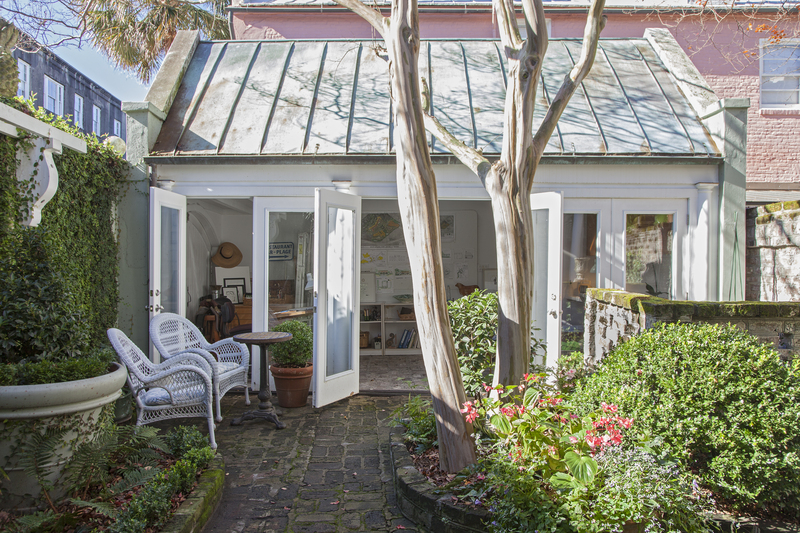 The property’s courtyard equally captured Bigner’s heart and sparked strong memories of the community garden space behind her childhood home. The new “backyard,” hidden from Chalmers Street but filled with the sounds of passersby, represented a connectedness she’d been missing in her adult life. At the time of her impromptu purchase, Bigner lived in Durham, North Carolina, in a sprawling brick Georgian on two acres of manicured lawn and rose gardens, all situated on a private golf course. It looked pretty, but left her feeling isolated. “I needed people again,” she says. “This small courtyard offered an intimacy I had longed for.” That feeling—bolstered by the sweet scent of tea olive wafting in the air—spurred her to make an offer. Once the deed was signed, Bigner characteristically took her time getting settled, and North Carolina remained home base for years as she wrapped up one last land-development project. But her Holy City abode was never far from mind. “I sat in my office in Durham and literally drew up where I was going to place everything,” she recalls. 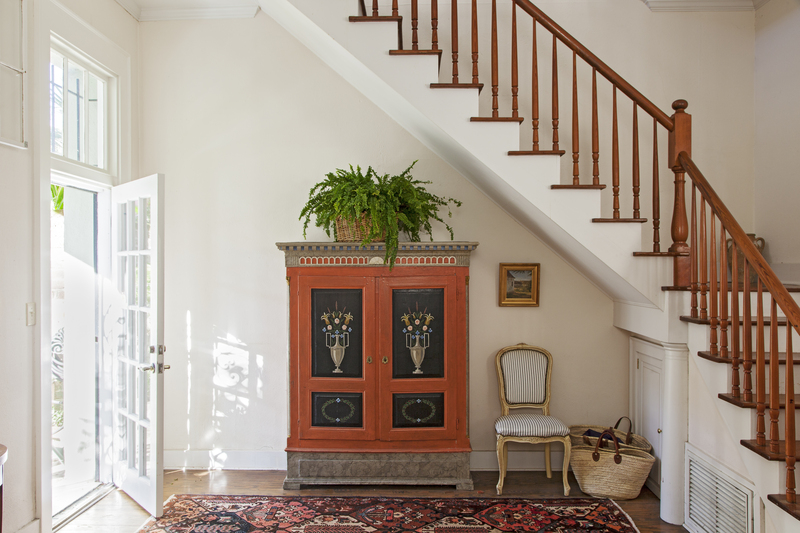 Cherished pieces she has owned for decades—such as a circa-1750 peasant-style Louis XVI cabinet (pictured on page 103) gifted by her parents on her 18th birthday—made their way south. 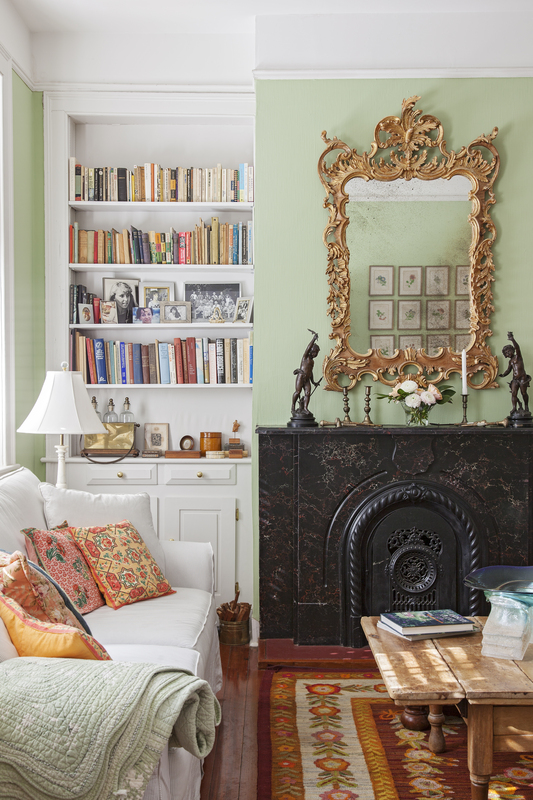 Set against walls painted in soft shades of green, cream, and peach, the antiques add warmth and personality throughout the home. Gesturing around the living room, Bigner says, “So many of these things are from my family in Denmark. 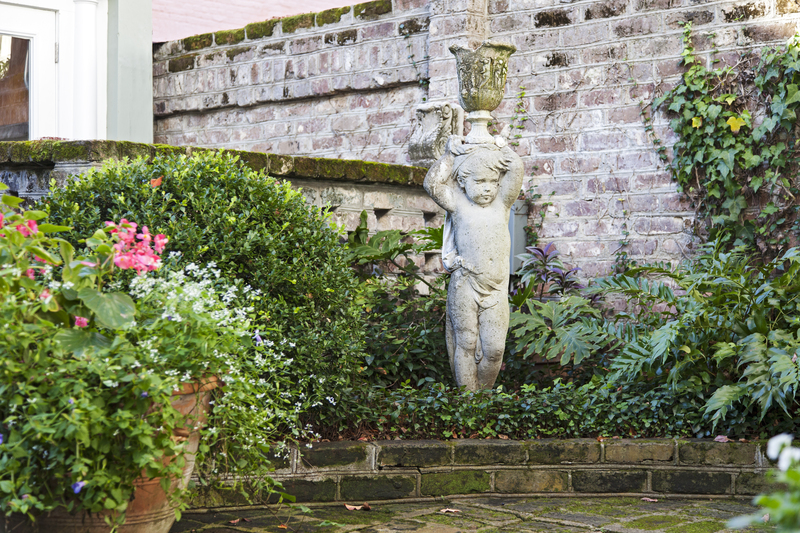 Little by little, I have been able to bring them over here.” The courtyard has evolved over time as well. She did away with the previous owner’s hot tub—and the unsightly concrete base that surrounded it—to make room for more plantings and an outdoor entertaining area. 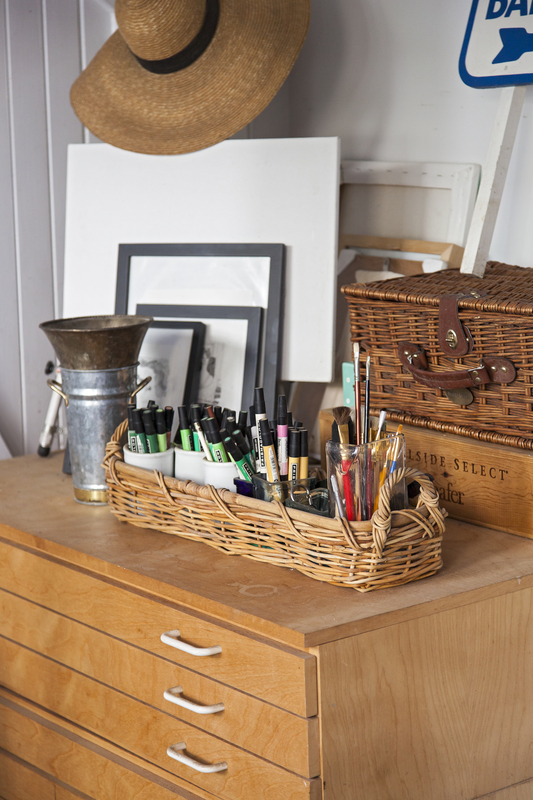 The resulting space is so inviting that it’s constantly drawing her out into the fresh air. “I, like most Europeans—and this is for real—live in my garden,” she says, sitting in her favorite wicker chair. “We don’t have them just for looks. I have breakfast, lunch, and dinner here, and I have people out here all the time. 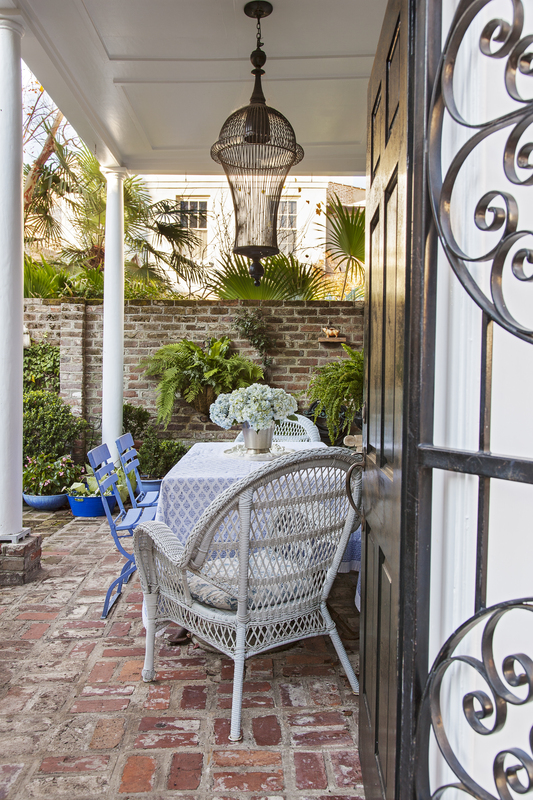 It’s just another room.” Commingling seats in a variety of materials and finishes lend the patio a welcoming, eclectic vibe. 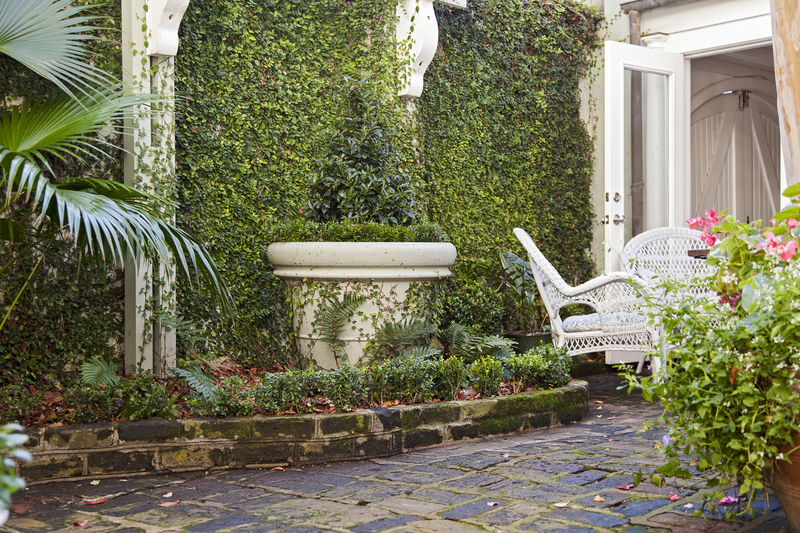 From this vantage, one can relax and take in the scenery, which includes a wall covered in creeping fig vine; well-worn statuary; and boxwoods, ferns, azaleas, and hollies in a variety of shapes and heights. Though she cares for her plants meticulously, shaping their silhouettes with those mini-scissors, most of them appear natural—and that’s by design. Bigner strives for a “chipped-paint” aesthetic that can only be achieved over time. “I don’t like to gut anything—I always like something that looks like it’s been there forever and that you just sort of tweaked here and there,” she explains. 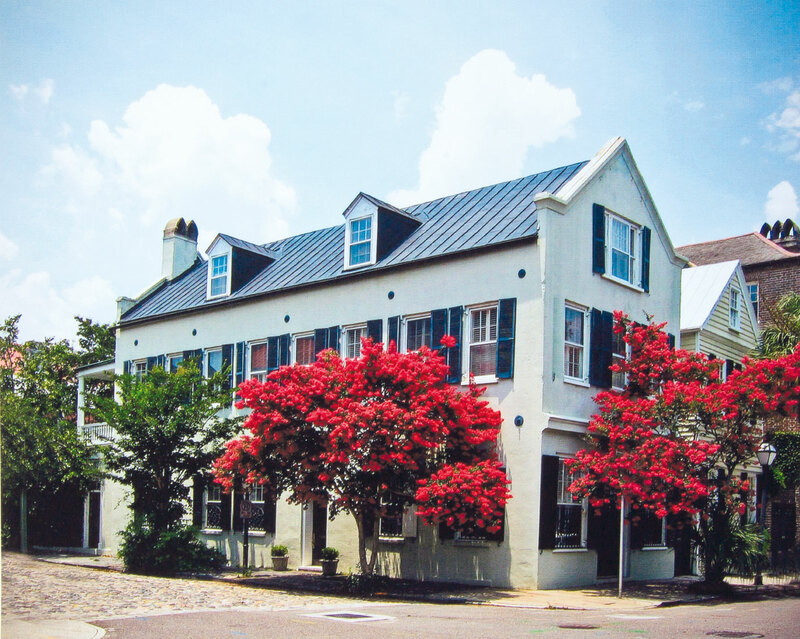 In 2000, Bigner retired and moved to the French Quarter full-time. Since then, her love for the place—and all the storied things within it—has only become stronger. As she knew it would be, the house is a perfect fit for her daily life; it suits special occasions with equal aplomb. Over the years, it has welcomed visiting grandchildren and hosted wedding parties for two of her three daughters. 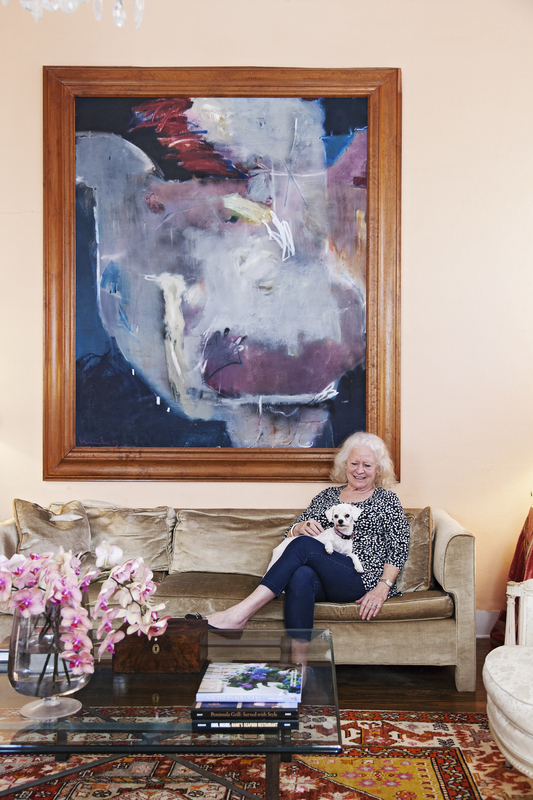 On this spring evening, however, Bigner and her pup, a bichon frise named Charlie rescued through Hallie Hill Animal Sanctuary, have simpler plans: to stroll down to the waterfront, then have some pals over for a pork tenderloin and fresh green beans eaten alfresco (of course!) by candlelight.